A little bit of sun goes a long way when it comes to fair skin. People with darker skin tones have more melanin, pigment which helps to block out a certain amount of UV (ultraviolet) rays. However, those with fair skin, especially combined with blue or green eyes and red, blond, or light-brown hair, have less protective melanin in their skin and absorb much more UV light. Before waiting for that nasty red surprise in summer, now is the time to start preventing sunburn and other skin damage by practicing the simple precautions most of us were taught in elementary school. Clothing is one of the most effective forms of sun protection. The sun Safety Alliance recommends clothing that is dark in color and tightly woven. Just imagine the dotty sunburn you would get through a loose-knit top! Long pants, skirts, and sleeves might seem counter intuitive in sunny weather, but they really are the surest protection if you’ll be outside for a long time. Sunscreen creates a chemical or mineral barrier between your skin and the sun, and is especially important when you are wearing short clothing, will be in the sun for more than 20 minutes, or if you’re going out in the heat of the day. Snow, sand, water, and concrete all reflect sunlight, so you’ll need protection around these surfaces too. Adults need a sunscreen with SPF 15 and above, and children need a sunscreen with at least SPF 30. You should still utilize sunscreen containing zinc oxide or titanium dioxide if you prefer mineral rather than chemical sunscreen, and make sure that it’s “broad spectrum”. This means that it blocks both UVA and UVB rays. 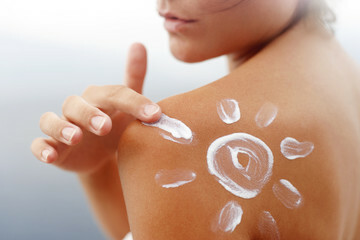 If you use natural products for sun protection with plant extracts, essential oils, and food-grade oils, make sure it still has the appropriate SPF rating, use a generous amount (at least enough to fill a shot glass, according to expert Jeffrey Dover), and apply it well in advance of going out into the sun to allow it to bind to the skin. Your face is one of the most vulnerable areas of skin, and the most visible. Slap on a tightly-woven, broad-brimmed hat to protect your face, ears, and neck. To take care of your eyes, slide on some sunglasses with UV protection included. It’s actually better not to wear sunglasses than to wear a pair without UV protection, as your pupils dilate with the darkness of the glasses and absorb more sunlight than they would have otherwise. Although it won’t prevent sunburn, drinking lots of water and liquids will prevent you from becoming dehydrated when you’re out and about. If you do notice you’re becoming sunburnt, find shade immediately and start sipping on water to prevent heat stroke. This is the simplest way to protect your skin. Simply enjoy the beautiful warm weather by sitting underneath a tree, shelter, or sun-smart shade cloth. You can create your own mobile shelter by using a large sun protection umbrella with an appropriate SPF rating. Just be careful not to poke anyone in the eye! Skin burns a lot more quickly when it’s not used to the sun. Try to get up to 20 minutes of “safer” sun exposure every day — before 10 am or after 4 pm depending on climate, altitude, and the season. If your skin doesn’t see the sun all week, you’re much more likely to burn during weekend outings. To keep your skin in optimal health and retain its resilience to sun damage, eat foods that are high in omega-3s (salmon, flax seeds, chia seeds, and walnuts.) Avoid processed oils and fats that are high in omega-6, eat plenty of vitamin E (sunflower seeds), and stock up on antioxidants (green tea, pomegranate, berries, and citrus). You can also apply natural sunscreen that includes many of the food-grade ingredients listed above, as part of your daily skin care routine. Although you’ll need to add some sunblock during the day as well, these products provide nourishment, hydration, and antioxidants for your skin to protect it against free radical damage and support skin renewal. Beverly Goldberg is a freelance writer and skin care enthusiast based in Los Angeles, CA. She loves experimenting with new products and ingredients, and frequently writes reviews about up and coming brands. In her free time, she enjoys gardening.